As you can tell from reading here, I’m pretty excited about Section 179 being raised to one million dollars. It’s a huge boost for companies, and to me, makes complete sense. Because when you allow a full tax deduction for equipment purchases, more companies will buy equipment – it’s really that simple. And that helps everyone – buyers and sellers both. Let’s talk about equipment sellers today, and the huge sales gift that the IRS is (and always was) giving them. 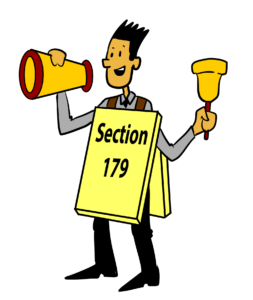 Because if you aren’t using Section 179 to help you sell equipment, you are missing out. Now on the surface, you would think that it’s not a big deal for equipment sellers to tout Section 179. After all, assuming the equipment qualifies (most does), the deduction is available to every buyer, and all eligible equipment, regardless of manufacturer, can get the deduction. In other words, two identical machine manufacturers can both say their product is Section 179 eligible. So it can seem a little like an auto manufacturer saying “our car has wheels”. Ahh, but there’s a difference. All car buyers are aware of the wheels (I hope so, anyway). But not all equipment buyers are aware of Section 179. Yes, believe it or not, there are thousands, perhaps even millions, of executives and business owners that are not aware of the Section 179 Deduction on a day to day basis. Oh, they will be aware of it when they visit their accountant at tax time, and the accountant gives them the pleasant surprise of a big deduction. But how many business owners would have bought more had they been aware of / reminded about about Section 179 earlier in the year? There is no doubt in my mind that if every business owner in the United States was magically made fully aware of Section 179 tomorrow that equipment sales would spike markedly by weeks’ end. So yes, using Section 179 to help sell more is, without question, a viable and desirable business strategy. And lastly, who cares if your competition can technically do it also? They aren’t reading this blog – you are. Get a leg up. Next time, I’ll talk about specific strategies you can use.